At the International Justice Resource Center, the UDHR’s values are central to our beliefs and our work. If you value IJRC’s efforts to make human rights protections more accessible to our readers and others around the world, please consider making a year-end donation. As the International Justice Resource Center (IJRC) works to build an Online Resource Hub that is useful to our global audience, our readers’ feedback is invaluable. We would appreciate it if you took a moment to answer the four questions in the below form or at this link. Thank you for sharing your thoughts with the IJRC team, and check back here for our regular human rights law updates and forthcoming resources. To stay up-to-date on international human rights law news, visit IJRC’s News Room or subscribe to the IJRC Daily. Happy Human Rights Day 2017! Happy Human Rights Day from the International Justice Resource Center! On this day, we celebrate the adoption of the Universal Declaration of Human Rights and the fundamental values it recognizes. At IJRC, we believe justice is borderless, but as the Universal Declaration of Human Rights enters its 70th year, much work remains to realize its vision. For nearly seven years now, IJRC has been working to make international human rights protections more accessible, transparent, and relevant to the lives of people around the world. Our services help ensure that individuals harmed by human rights violations can achieve accountability and redress, no matter their circumstances. Watch below for a one-minute glimpse into one area in which our work has made a difference over the past year. Our online readers and users are vital partners in this struggle.We invite you to join us in celebrating Human Rights Day by investing in the promise of the justice beyond borders and human rights for all. During this giving season, every donation to IJRC will be matched – dollar for dollar – doubling the impact of your support. And, an additional 1% will be added to every donation made through the PayPal Giving Fund. On behalf of the IJRC team and the many people we serve, thank you for joining us in this important work. 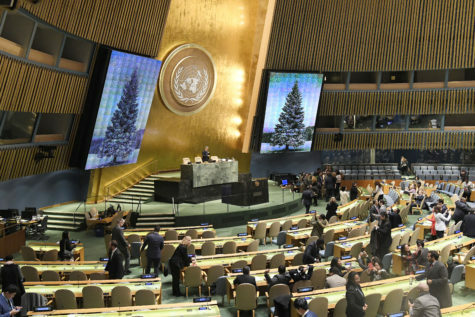 In November, several universal and regional bodies will assess States’ compliance with their human rights obligations, through the consideration of State and civil society reports, country visits, dialogues, and hearings on individual complaints. Six United Nations treaty bodies will be holding sessions in the month of November on issues related to civil and political rights, women, racial discrimination, and torture. The Universal Periodic Review Working Group will also be in session and will review nine State reports, holding interactive dialogues with those States’ representatives. 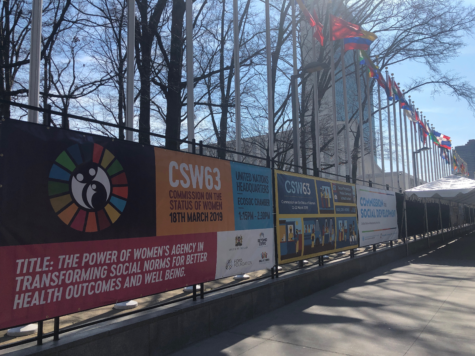 Seven UN Special Rapporteurs and one working group expert will conduct country visits, and three working groups will be in session in Geneva, Switzerland. 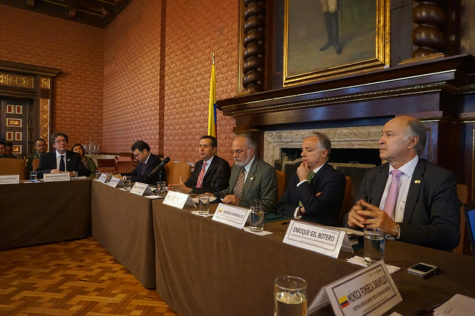 Regionally, the Inter-American Commission on Human Rights (IACHR), Inter-American Court of Human Rights (IACtHR), African Commission on Human and People’s Rights (ACHPR), and African Court on Human and People’s Rights (AfCHPR) will all be in session. The Grand Chamber of the European Court of Human Rights (ECtHR) will hear three cases related to inhuman and degrading treatment in the context of the effectiveness of a criminal investigation, fair punishment in the context of suspension from public office as a penalty for conviction, and the legality of detention as a preventative measure. 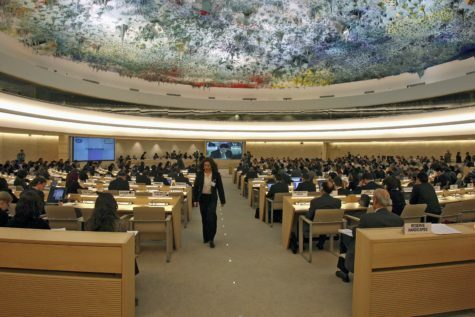 The UN Human Rights Council’s and UN treaty bodies’ sessions may be watched via UN Web TV. The IACtHR’s session may be viewed on its website or Vimeo page, and the IACHR sessions may be viewed on its YouTube channel. The African Court sessions may be watched on its YouTube channel. The ECtHR hearings may be viewed on its webcast. To view human rights bodies’ past and future activities, visit the IJRC Hearings & Sessions Calendar. 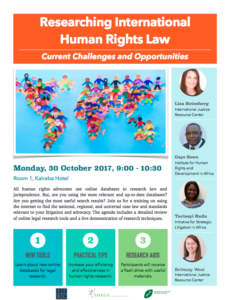 The International Justice Resource Center (IJRC) in collaboration with the Institute for Human Rights and Development in Africa (IHRDA) and the Initiative for Strategic Litigation in Africa (ISLA) will hold a training from 09:00 to 10:30 on October 30, 2017 at the Kairaba Hotel in Banjul, The Gambia, ahead of the 61st Ordinary Session of the African Commission of Human and People’s Rights (ACHPR). The training, which will take place at the seat of the ACHPR in Banjul, seeks to provide human rights defenders, advocates, and victims with updated tools and strategies for conducting research on sources in international human rights law, State compliance with human rights obligations, and national legislation and jurisprudence. As part of its 61st Ordinary Session, which begins on November 1, 2017, the ACHPR will celebrate its 30th anniversary; the ACHPR will use the commemoration to assess the progress of the Commission and to develop strategies for the future promotion of human rights in Africa. [ACHPR: Anniversary] IJRC invites all attendees of the 61st Ordinary Session and preceding NGO Forum to attend this training. For more information, see IJRC’s event flyer and training description.